AFK stands for "Away From the Keyboard" and essentially means that you are away doing something else, like sleeping or studying. The GWO developers don't want players to put off necessities like this simply to play a game, so they designed the AFK system to give players the freedom to continue playing and leveling even while they are busy with something else. Hit "F12" or click the "AFK" button on the right to open the AFK interface. Tick the Auto-cast and drag your skills to the skill column below, so the character can attack enemies with these designated skills. Tick the Auto-attack and then your character will attack in common mode. Tick both of them to use skills and common attacks alternately. Note: If you tick the Auto-cast, at lease one skill must be in the skill column, otherwise, your character won’t be able to use skills to attack. Enter various potions or recovery skills in the box behind so when your character's HP or MP drops below a certain number, the potions and skills can be used automatically. Note: Don't forget to save the settings you have made. This function allows players to revive themselves automatically after they die while in AFK mode. However, each revival costs 10 Gold. 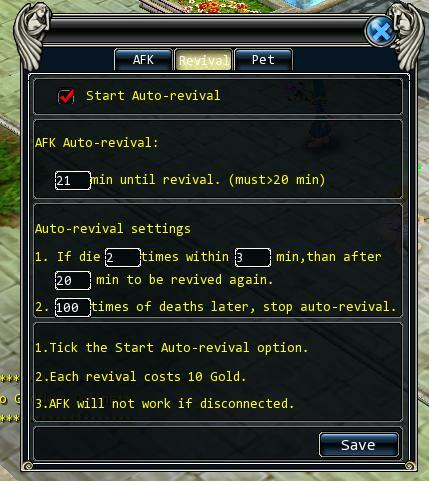 Click "Start Auto-Revival" and set the time when the character will revive. 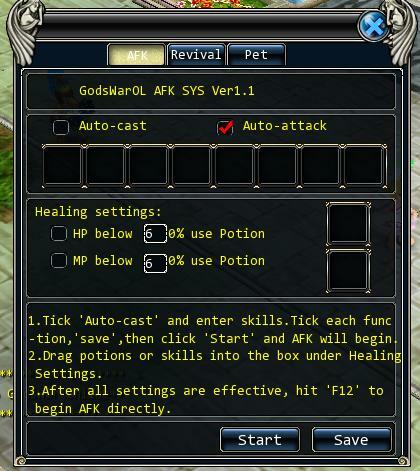 Players can also choose to stop auto-revival under certain circumstances. Finally, save the settings. Note: If players don't have enough Gold in the bag, the auto-revival function will not work. 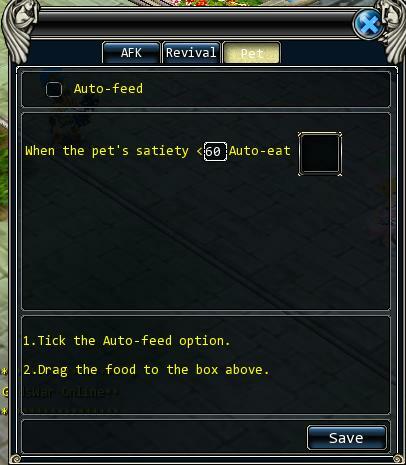 When a pet is summoned, its satiety, amity and lifetime will reduce gradually, so if you choose Auto-Feed, you don't need to worry about your pet being recalled while in AFK mode. Enter food in the box and set the pet to eat it automatically when its satiety drops below a specified number. Note: The food type must be in accordance with your pet. When you've finished with the settings, find a place with suitable monsters and click "AFK" or hit "F12" to start AFK battling. The AFK function makes adventuring a snap, why not join in the fun while you're away?